Love it. It is perfect in my space and the rug feels fantastic under my feet. Very well made and much thicker that the last one I purchased. I'd like to carpet my whole house with this!!! This rug is higher quality than you would think for the price. The weave is awesome. The gray color has hints of other colors that highlight the natural tones - in the photos it appeared that the gray would be more solid, consistent, but there are natural undertones of other colors that makes the gray not as flat and uniform as it appears in the photo. Amazing look and quality. I really wanted to like this rug, but unfortunately it was wet inside the packaging and has a very musty smell. The color is more green than grey and there are a couple of discolored areas where the fibers have a pink/peach color. I've placed this plush rug at my sink and look how comfy it feels to my feet. It's lush and cushy and a great heavy weave. Great rug and beautiful color. I really like this rug, I bought two different sizes for my home and couldn't be happier with the purchase. The thickness and texture take a little getting used too but they are sturdy rugs that catch a lot of dirt from entering the home. I would recommend these rugs to anyone. Im giving this rug a 5 out of 5 stars because the rug is a great look, especially for the price. It has a very natural and organic appearance to it (probably because it is natural fiber). Really complements my grey tone wood plank flooring. 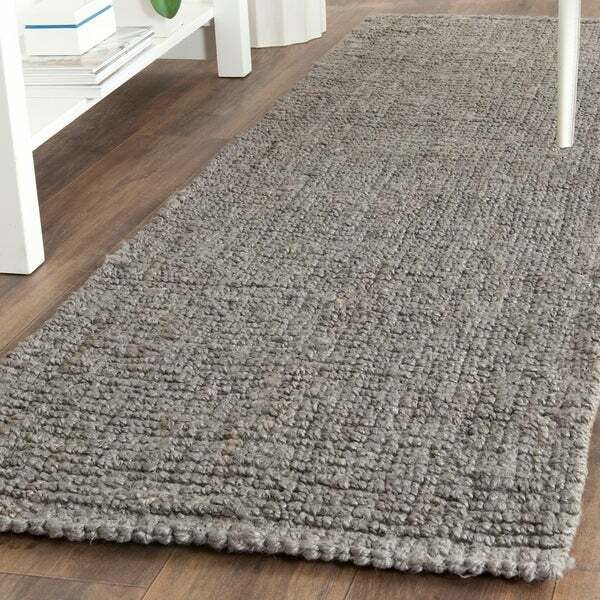 The nice surprise about this rug is that what looks to be a stiff hard weave surface is really comfortably cushy under bare feet. Actually fun to walk on barefoot! It fits perfectly in front of my master bathroom double vanity. I have a thin rug pad underneath the rug. Be advised that initially you will need to remove a few hard plant fibers that are woven into the rug, not a big deal. Overall, I love it! I love this rug! Its the perfect size for my space, the color is neutral and I love the texture! Safavieh rugs are great quality and overstock has great prices on them. We are very pleased with this rug! 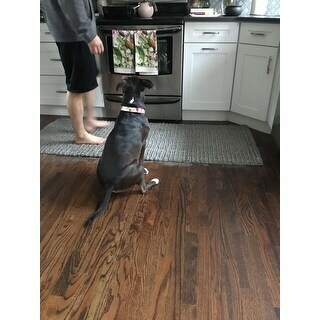 We lplaced it in kitchen and it’s very comfortable when standing loading dishwasher. Nice neutral gray color. Vacuums well. I love this rug! The color is perfect too! Looks great, color is a nice natural grey. Leaves a light dusty powder under carpet. It’s probably dried dye;which is annoying to keep sweeping up. Other than that’s its perfect chunky area rug! I was excited to see the rug in person. It is grey with a very slight bluish undertone which went along nicely with my grey/ white kitchen with pale blue walls. 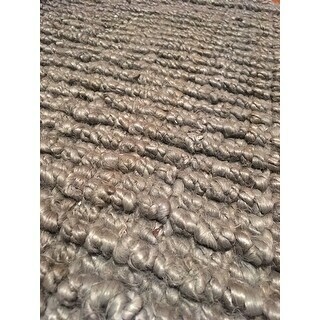 However this rug is much thicker than what is listed. It was anywhere between 3/4 inch and 1 inch. It will not work where I was planning to put it due to my French doors opening inward. I would have given it 5 stars except for the thickness. It is beautiful with a nautical/rustic feel. I decided not to send it back due to shipping hassle, but am using it in another room. So now I am leery about stated rug thickness. I was not planning on using a rug pad. Tag states it was made in India. Unfortunately this didn't work out for me. It was very thick and chunky and not what I was looking for. Read specs carefully to make sure this will work for you. This is a great rug. The weave is a little more loose than I expected based on the pictures, but it’s a great value for the price. The end needed a couple of days to fully flatten. 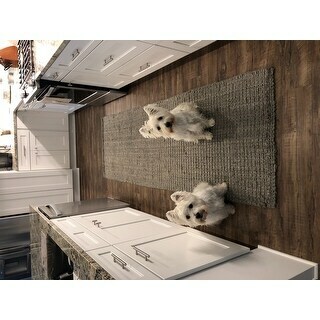 This rug is great! This is my second time to purchase this exact rug. I sold the first one that I owned for a year with my old house, and I have purchased a new one for my new house. It holds up well to daily traffic. I vacuum it every few days, and spills clean up easy with a damp cloth. I have been looking for a rug for my foyer for quite some time. I thought this was the one! When it arrived, the rug was very damp and smelled very musty. After sending it back for a second one, it too came damp and smelling very bad. Had to send that one back as well. Very disappointed! The fibers have gaps in the weave. I didn’t even need to open the package all the way to see that these gaps would cause a problem with our 3 dogs getting a claw caught in the fibers. Love the look of the pictures, but sadly, had to return. This rug is waaay chunkier and far less smooth than depicted in the photo. It looked super rustic and wasn’t a good fit for my decor. 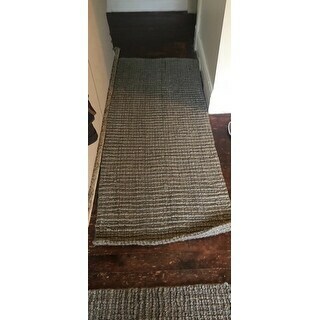 The second photo is actually the underside of the rug, but shows you just how high/thick the rug sits when it’s flipped over. I love this rug. Color and size are perfect but I was disappointed in how hard it felt on our feet as we do not wear shoes in the house. I flipped it over in the mean time as the bottom is a little softer in hopes it will soften on the top with usage. I love the look of this rug. It is a little rough and seems to shed a lot. It does do a great job at staying where you put it. That has been great with the little kids running down the hall. Thick and very organic hopefully will be able to stand up to time. Great color. Substantial weave and feels great under my feet. I put this on my kitchen floor by my sink. Every bit as good as WE or PB rugs. These carpets are horrible! they are full of dirt, hard tiny pieces of rolled paper that pierce the skin when you walk on them..but the worst...I found a rusty nail in one of the carpets as I was rolling them back up to return them. I purchased 5 and 2 of them had stains, round circles of oil or something similar on them... this was what started my return. Once my review is accepted I will post a picture of the old rusty nail that popped out as I was rolling one of them up. Seems as if these carpets were made on the ground in the middle of a desert. They literally left a small pile of dirt on the floor as I rolled them up. I Do not recommend purchasing these carpets. "Is the rug machine washable"
It is not advised to wash this rug. Routine vacuuming is the most important step in maintaining the life and beauty of your rug. It is recommended that you have area rugs professionally cleaned every 1-2 years to remove deep set dirt in high traffic areas. Otherwise, attentive vacuuming will significantly extend the life of area rugs. "Can it be vacuumed without getting sucked up into the vac? I'd really appreciate a quick reply. Thanks! :-)"
We recommend light vacuuming to prevent weaves from loosening. This rug should be able to be vacuumed. 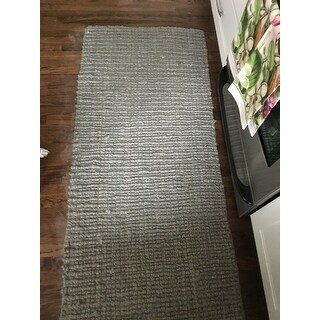 Purchased this rug to go in front of bathroom sink.